Appearance (0-20): This sun-grown habano wrapper holds a nice brown color, and is wrapped to well. AJ Fernandez is my personal favorite manufacturer, and has some of the most consistent smokes on the market. I have never smoke a cigar from him, and it has been a lot, that every disappointed me. That really speaks volume when cigar makers are creating thousands of cigars for enthusiasts. Back to the appearance: This is the absolute best band that I’ve ever seen. Its beautifully done, very intricate, and shows that appearance is a focus to AJ Fernandez as well. Construction (0-20): There are 2 things that I really focus on when looking at construction: Ash and Smoke. The ash probably could have held on for 2 inches, but I dropped it off before then. It also had an almost pure white ash, which is indicative of the rich soil that it was grown in. The smoke was also white and came in great volumes. There was one long vein down the end of the cigar, but it burned even and cool all the way down. This is the first cigar that I ever smoked all the way to less than a ½ inch. 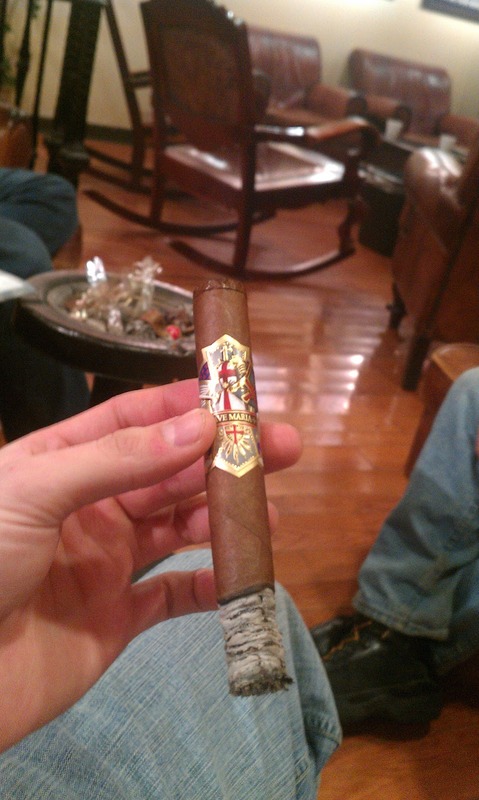 Strength (0-20): The Knights Templar (6x52) was a nice size cigar, and it teetered around medium throughout the smoke. Through some reading about the cigar, they can also move down the line to a fuller smoke depending on size. I was definitely happy with the strength, especially when it is paired with the amazing flavor. If you want something with more strength, AJ has some other smokes in his product line for that. Flavor (0-20): Wow. 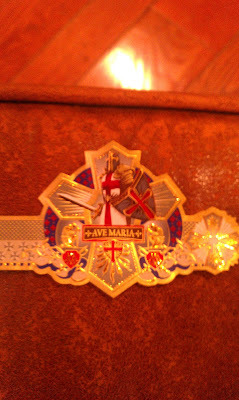 I haven’t smoked an Ave Maria probably in a year, and this was amazing. I tend to stick to darker wrappers and fuller bodied smokes, but I gave this another shot. I love a cigar that has multiple flavors and complexities, and this doesn’t fail to deliver. There are strong notes of leather and wood, but you can still pick up small hunts of flavors throughout. You will pick up on some spice, nuts, and cream as you progress down the cigar. The flavoring of this stick really surprised me, and I forgot how good it was. Value (0-20): Depending on the size you pick, you will range from $7 to $10. This one was $7.00, and well worth every penny. I would almost suggest this to be a “Go-to-Stick” whenever you need something reliable to fall back on. Do yourself a favor, and pick yourself up this cigar for this price. Additional Notes: Paired with Pepsi. Smoked at Cigars International. Overall (0-100): In case you missed the review, buy this cigar. The cigar was super enjoyable from the initial light, right down to where I almost burned my fingers because I didn’t want to put it down. As I made mention to, AJ Fernandez is an amazing manufacturer. He also makes the Diesel, Man O War, and San Lotano just to name a few. If you enjoy any of those cigars, try this and enjoy. I am happy to have 2 more in my humidor, and I won’t be waiting a year to smoke this one again.